Above: POPLAR. EAST LONDON. 1950’s. Bow Creek Wharf is the title of my own personal project, set in the East london docks during the immediate post WW2 era, 1946. This will be a model railway layout based on a fictional extension of the old London & Blackwall line that ran from Fenchurch St. station to Blackwall, near to Brunswick wharf on the River Thames. The original line that terminated at Blackwall had a passenger service only until the mid 1920’s with goods, serving the various docks and warehouses, carrying on for some time after. My fictional line extension will be based in the immediate post WW2 era, c’46, I have assumed that the passenger service continued although goods and trip freights dominate the traffic. The layout will centre on the wharf, with transfer sidings, receiving and sending out trip freights to and from Temple Meads (Stratford), Millwall and Goodmans Yard. These transfer sidings serve an ex GER warehouse, which will be based on the old GER owned Pepper warehouse that was further along Bow Creek, now owned (1946) by the LNER. The sidings also serve a coalyard and a short tramway that serves some of the river side industries (Oil works, and boiler smiths). The passenger station will also feature on the layout , although this will be part of the background feature with surrounding buildings and industrial premises and a road over bridge connecting the main road with the dock and warehouses. Proposed plan of "Bow Creek Wharf"
The above sketch is some what compressed in its length and in reality would be a lot longer in relation to the depth, so please try to imagine it a little more stretched out. As can be seen in the lower drawing it is proposed to be part of a larger scheme at a later date. The junction with the main line at (B) will be based on Stepney Jct. on the exLT&SR line which was where the original Blackwall line branched off. This would be on brick viaduct, as the GER so often did. This part of the layout would be at a height of 60″ from floor level to the top of the viaduct parapet, a little under eye level for me. 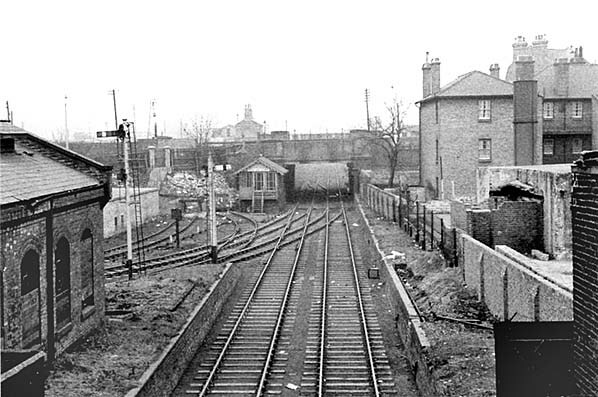 It is basically four tracks coming out from the London end (storage loops), as far as the jct. 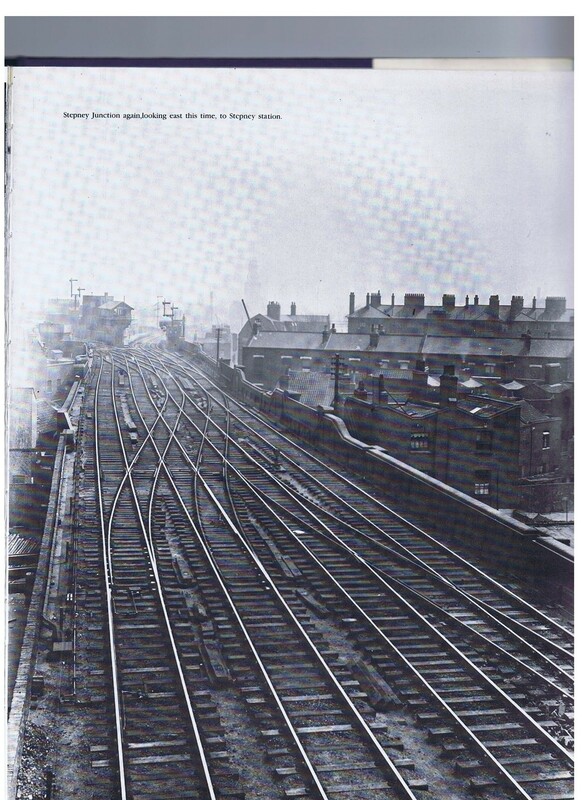 with double track continuing on the main line to the left to either Stratford,LNER, or the LT&SR (LMS in ’46) via Gas Factory Jct., and the other double track , branching to the right, down to Bow Creek via Millwall. There may be further changes to this plan with regards to the track layout so please take a look now and again, I will welcome your comments, critical and constructive. Stepney Jct. The inspiration for the main line section on the proposed layout. At position (E) would be the jct. station with the tall wooden signal box, that I feel characterised Stepney, at the apex of the platforms serving the down branch and up main. At position (F) I have thoughts on a large rail served warehouse similar to Goodmans yard that was by the station throat of Fenchurch St. station. At (D) would be the cassettes/storage loops under the Bow Creek section. The area at (C) will be the position of the Ex GER pepper warehouse, track layout yet to be determined, served by the exchange sidings by Bow Creek Wharf. So the initial idea is to start on the Bow Creek area, perhaps being used with cassettes at position (A), the Blackwall end, until the rest can be built at a later stage. As I mentioned earlier the inspiration for the layout centres on the transfer sidings and the ex GER pepper warehouse that were situated on Bow Creek. In reality these were connected to the rest of the system at Canning town on the North Woolwich branch, but for my purposes I have altered the geography and shifted them round the creek (or should I say “up the creek”). The picture below shows the edge of the wharf by the exchange sidings at Canning Town and this is what I will base the front edge of the layout on. 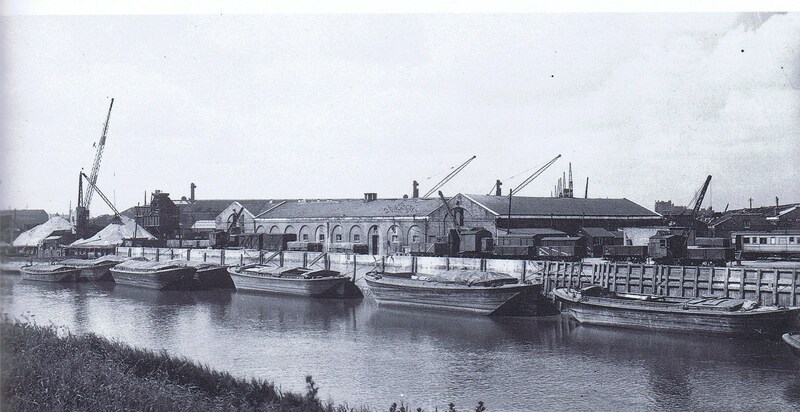 This next photo shows the Pepper warehouses and the barge bank on Bow Creek and will be the prototype for my warehouse and wharf. This will be enough work to see me out (Ha, Ha,)through retirement, so I’d better get cracking ! More to come on Bow Creek, buildings, rolling stock, traffic etc. Your model making is inspirational! Bow Creek Wharf sounds full of modelling potential and I look forward to seeing the finished layout at a Guild event. 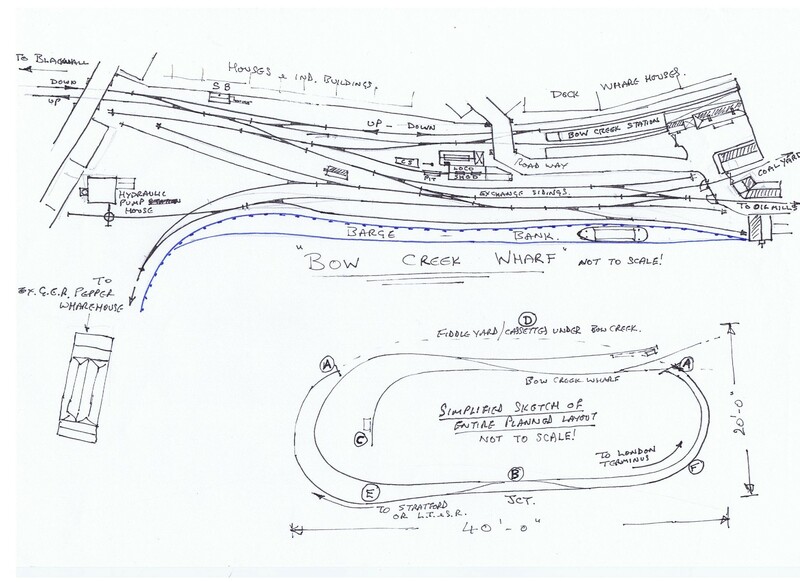 Thanks for your kind comments, it’s early days with regards to construction of “Bow Creek”, I have been planning for quite a few years now and have a box file full of doodles, sketches and info’ but now think that I have condensed it all down to a firm plan. I will try to post up a track plan of the layout soon. As to exhibiting, I had not perceived it to be an exhibition layout as it is planned to be part of a larger scheme requiring an area of approx. 40′-0″x 20′-0″. The idea being to build a purpose built, timber framed building to house it at a later date. Having said that, the part that is “Bow Creek” could be taken to exhibition eventually, if I build on sectional baseboards. Both you and I will need to begin a production line to build a few of those river lighters. How are you mate, nice to hear from you. I have been looking for ages for some scale plans of these and the Thames barges but to no avail, any idea’s? 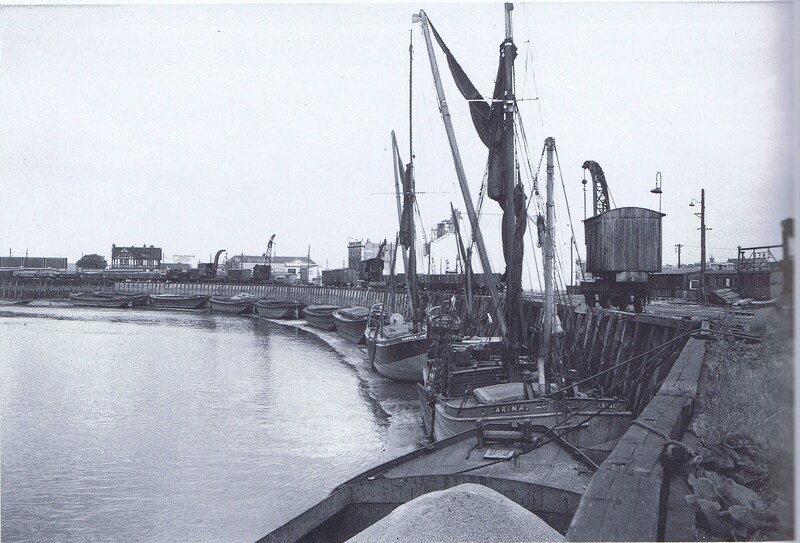 There are the real Thames barges at Maldon, Essex, but have not located a lighter yet. There was a near-to-scale Thames Barge kit ripe for upgrading on the market a couple of years ago, but I was too late to get one before they ceased being produced. However I believe there are plans available. The hull could be a candidate for rapid prototyping. The lighters are a different kettle of fish – lots of old photos of the things, but I can’t find any decent drawings. interesting proposal, i want to do poplar dock NLR & millwall jnct but when, who knows, a very interesting area of east london i wish i knew it earlier than the 70s. good luck, chris bonnick. I too had toyed with Millwall Junction as a layout, would make a fascinating model. What scale would you be working to?. hi colin, i am working to 00 scale which isnt to bad to scratch build buildings etc. 03 diesel shunters & jinties for the NLR & saddle tank 040s for the PLA. Perhaps a Derby lightweight for the MER. Lots of scope for a small area 26 acres & thats without the L&B & the Midland Poplar Dock & the GNR up against the East India Dock wall. Chris Bonnick. Dear Colin, being as the family came from Bow shouldnt you be modelling the North London Railway. A Park 0-6-0 perhaps? or Bow Works ( i have an original plan if that will help). Stop you getting bored!!!. Chris Bonnick. In fact my Grandfather lived very close to Old Ford station at one point so perhaps the L&NWR, but the docks have always held my interest. colin, so are we a couple of Dockees???. chris. Hullo, I still have two 7 m.m. Thames barges, quite scaleable, (originally imported by a Chinese company called Hannah in N, OO & O). I live in Manor, East London, still revising layout ‘Canal Sidings & Albert Street E.20.’ and have been 7 m.m. since 1997, 0 gauge memb. 13921. I read your ‘East- side Pilot’ in the Gauge 0 web- site link. We may have a lot in common. (I also put the real B12 & J15 into BR in 1990s, plus the “Bongo” 61264), please contact… Tel. No. 0208- 553-3223.